Home > Women and Children > Can children be affected by migraine? Can children be affected by migraine? Yes! Many people think children and teenagers do not get migraines. 2% of children under 6 years old have migraines (approximately 1 child out of 40). 4 to 11% of children from 6 to 11 years old have migraines (approximately 1 child out of 15). 8% of boys and 23% of girls from 12 to 17% will have migraines (close to 1 teenager out of 7). For about 50% of adults suffering from migraine, the first attack occurred before the age of 20. 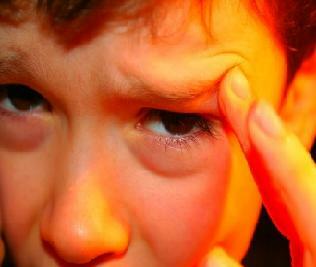 In many cases, a family member of the child suffers from migraine. Can children have migraines, even before puberty? Close to 7% of children have migraines (boys and girls equally). Often, the attack is easy to recognize for the parent: the child’s face is pale, sometimes gaunt; he/she stops playing and asks to lie down or to be alone. Obviously, he/she can also complain of headache or nausea. The duration of children’s attacks is shorter than those of adults. Sometimes, it is over in 2 hours. If your child’s attacks look like migraines, discuss it with a pediatrician, because treatments exist. Some children also have episodes of profuse vomiting, abdominal pain, or severe vertigo, recurring several times a year. These episodes are considered by specialists as conditions analogous to migraine (these syndromes are called: cyclic vomiting, abdominal migraine and benign positional vertigo). Children and teenagers suffering from migraine without having a proper diagnosis could be mistreated. Their quality of life is significantly worse than the quality of life of those not suffering from migraine. Attacks can lead to school absenteeism and difficulty participating in family or social activities. Remember that school is stressful for a child, thus migraine attacks can actually occur on Sunday nights or Monday mornings; the child is not simulating or trying to manipulate you to avoid school.